This thesis presents a collection of studies on the perception of paralinguistic intonational meanings, which stem from three biological codes, the Frequency Code, the Effort Code and the Production Code. On the one hand, these studies shown that listeners, regardless of language back­ground, perceive paralinguistic sound-meaning relations in unknown languages in a similar way and as the biological codes predict. This finding is argued to reflect underlying universality in paralinguistic intonational meaning. On the other hand, results bring to light significant differences between speech communities in interpreting pitch variation in their native language. First, a speech community may perceive a larger meaning difference for a given interval of pitch variation than another. Second, two speech communities may occasionally interpret the relation between pitch variation and a given meaning in opposite ways. And third, one speech community may associate pitch variation with a certain meaning where the other does not. Proposals are made to explain these cross-language differences. In addition, in the perception of paralinguistic intonational meaning in a second language, L1 transfer is found to play an important role. At the same time, L2 learners appear to acquire the paralinguistic interpretations of the L2 to some extent, and consequently interlanguage behaviour emerges. The findings call into question theories of intonational meaning that only advocate universality in the paralinguistic uses of pitch variation. They lend strong support to a theory that regards the biological codes as a point of departure and recognises a distinctive language-specific component in the implementation of these codes. 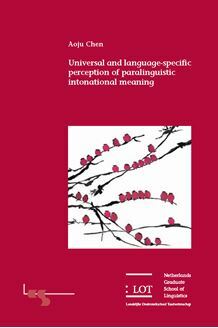 Presenting interesting data from an exciting perspective, this book takes positive steps forward in our understanding of the nature of paralinguistic intonational meaning. It will appeal prosodic phonologists, phoneticians, pragmaticians, and psycholinguists working in the field of second language acquisition.